The architecture typically associated with Melbourne’s north has made its way to the city’s east with a new multi-residential development in Swan Street, Richmond. Farmer Cutter & Swan, designed by MA Architects and developed in partnership by Icon Developments and Beams Projects, was designed to inspire other projects to adopt its contemporary design and create a new standard of living for those looking to settle in Richmond. Icon Senior Development Manager Brinn Tavener said Farmer Cutter & Swan was a unique solution for those seeking the design quality of apartments found in the north, but the active and well-connected locality offered in the east. “Currently there is a lack of design-focused apartments in Richmond. 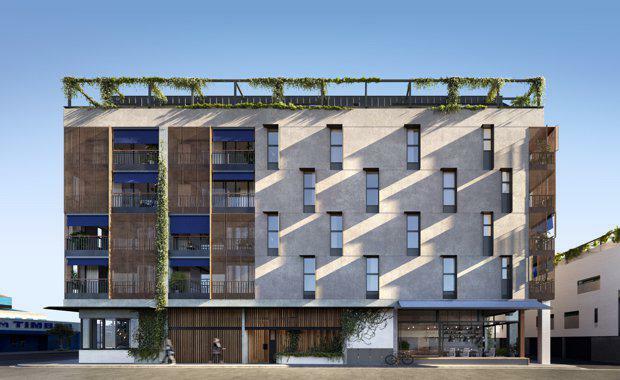 We wanted to create the kind of apartments found in places like Fitzroy and Collingwood, and use this to cater for the young professional market found in Richmond,” Mr Tavener said. Since launching earlier in the year, Farmer Cutter & Swan sold 63 per cent of its apartments with 90 per cent of sales going to the owner-occupier market. Beyond the design, Farmer Cutter & Swan was carefully planned to maximise its inner-city location and provide residents with easy access to a range of amenity. “Richmond is a highly sought-after area due to its restaurants, cafes, proximity to sporting arenas and shopping precincts it offers residents. We are excited to be able to offer a development that can cater to this active lifestyle,” Mr Tavener said. Centred in a food focused-neighbourhood, the development is nearby to first-class restaurants and popular cafes on Swan Street, Church Street and Bridge Road. Additionally, open green spaces and parklands surround the development, with the Yarra Bend just moments away. Farmer Cutter & Swan is also well connected to public transport, with tram stops at the front door on Swan Street and Burnley Station just 200 metres away. Completion is expected in May 2019.